Thank you for visiting Complete Lawn Service. Your search for dependable Springfield lawn service ends here. Complete Lawn Service is just that…a full-service lawn care and landscaping company that has been serving northern Virginia residents and businesses for four decades. Our team of professionals brings a wealth of knowledge and uses the latest technologies and highest quality materials to beautify your outdoor space. We do lawn care. We mow weekly, edge every other week, and maintain the proper grass height for the time of year. We also provide a full range of seeding and feeding programs for the best possible soil quality and fertilization. Our tree, shrub and bed care program includes planting and maintenance of growing trees and shrubs for an outdoor space that stays appealing. We build landscapes. Our full-service landscaping combines a layout of plants and shrubs with a hardscape featuring walkways, patios and water features. Our landscape design includes a drainage method that protects your space from flooding or compacted soil. We design irrigation systems. Complete Lawn Service will design a custom sprinkler system for your space that will properly irrigate your lawn without wasting water. Our Certified Irrigation Designer will inspect your space, determine the proper watering needed for each area, and design an efficient, automatic sprinkler system for you. After installation, we’ll handle the maintenance and inspection year-round. We wipe out mosquitoes. 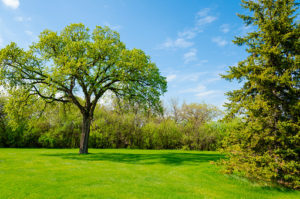 Our mosquito control system uses a natural oil spray that is environmentally friendly, and you can access the property immediately afterward. That’s not all…in the winter months, when we’re not busy providing dependable Springfield lawn service, we use our plows and shovels to dig out snow and ice covered driveways and get you outside again. We hope to be your choice for professional and dependable Springfield lawn service. You call us or click on “Get A Price” and fill out the form for a free landscape consultation. Contact us today and let us create your beautiful outdoor space!